Love Must Win Out opens with the assassination of Óscar Romero, and it has all the elements of a thriller: secret teams of gunmen in silent cars, the archbishop lifting the host above his head in grave prayer, the shot that cracks across the air and the screams that erupt in the chapel as he crumples behind the altar. It’s cinematic—and several movies have been made out of it. We watched Romero with Raúl Juliá in class when we were kids. But then Love Must Win Out goes on to open up and explore Romero’s entire life, inside and out, and reveal the man behind the story. Kevin Clarke is a thorough and diligent writer. He puts together his narrative carefully, piece by piece, and examines every possible angle. What stands out most are the intimate moments: the little boy running around with a paintbrush sprinkling water on top of his friends and blessing them, the young priest sharing letters and stories from people over the radio, Romero losing his temper and storming off from a Mass that had devolved into a shouting match. Romero comes across as more human than symbol in Love Must Win Out. He was conflicted and suspicious, torn between politics and the Church. His siblings remembered him as ‘prayerful, too serious, perhaps a little sad, always “turned inwards” … “My brother thought too much,” one recalled’. In middle age he was characterized as a stubborn scold, longing ‘to live as a real pastor, not as an insufferable bureaucrat’ and yearning for personal connection. If his death was memorable, Love Must Win Out makes Romero’s life even more so, and reminds us that his spirit is alive even today. 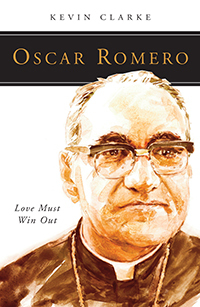 Order Óscar Romero: Love Must Win Out online today for only $11.00! * This offer is available only for those orders placed on our website. Be sure to apply promotion code Oscar15 before checking out! This offer expires January 30th. * Price does not include tax and shipping. Tax and shipping costs will apply upon checking out.